Salads don’t always have to be cold! 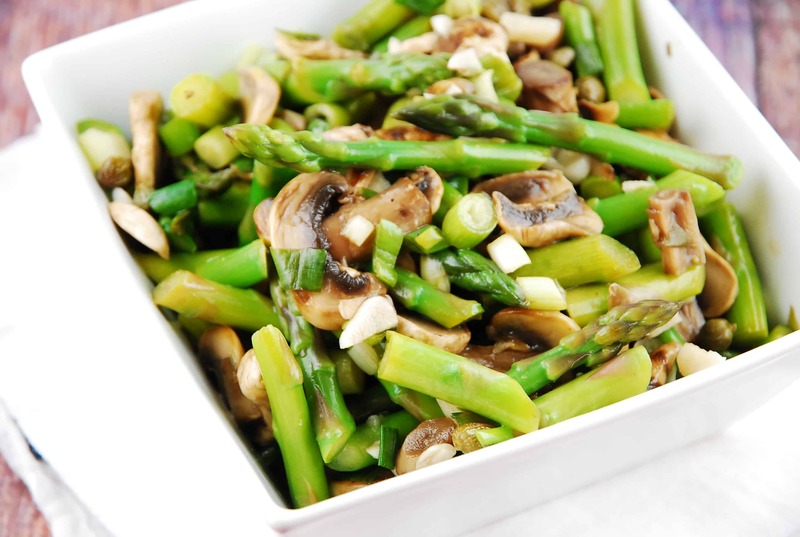 This delicious Warm Mushroom and Asparagus Salad Recipe is a breeze to make, with minimal ingredients and cook time, plus it tastes fantastic. Most people either love or hate mushrooms, so to make this Weight Watchers side dish recipe, you’ve gotta be a mushroom lover, as the lovely, earthy taste of the mushrooms is beautifully featured. The crisp asparagus is the perfect complement to the tender mushrooms, and the simple vinaigrette brings everything together without being too over-bearing. At just 2 Points, this easy vegetable side dish offers a delicious way to get in those veggie servings, and works great with just about any main course. A wonderful combination of flavors and texture, this warm salad is a wonderful side to a variety of meals. It can be prepared in just minutes, and is so low in Weight Watchers Points. Bring a large pot of salted water to a boil. Toss in asparagus, and blanch for about 2 minutes. Immediately transfer asparagus to a bowl of ice water to cool, and then remove asparagus from the ice water and place in a medium sized bowl. While water is coming to a boil, heat oil in a medium sized nonstick skillet over medium high heat. Add in mushrooms and garlic, and cook until mushrooms are tender, about 5 min. Remove from heat and add in to the bowl with the asparagus. Now add in the vinegar, dried thyme, and salt & pepper. Toss well to coat. Serve immediately. This was a great recipe! Made it exactly as instructed–except I ran out of fresh mushrooms and threw in some canned ones with the sautee. Everything was great! I made it as a side dish, so if you’re considering this recipe, do note that the serving size is a full cup. It could definitely work as a main dish! This looks amazing! I’m doing Simply Filling technique, and this will fit in well with that too!